What Will Clean Burned Butter Out of an Oven? During the cooking and baking process, it is not uncommon for food splatters to occur inside the oven. When this happens, the high temperatures will quickly cook the splatters — such as butter — and burn them onto the oven walls, ceiling and floor. Fortunately, various inexpensive and common household cleaning items will remove the burned butter from your oven. 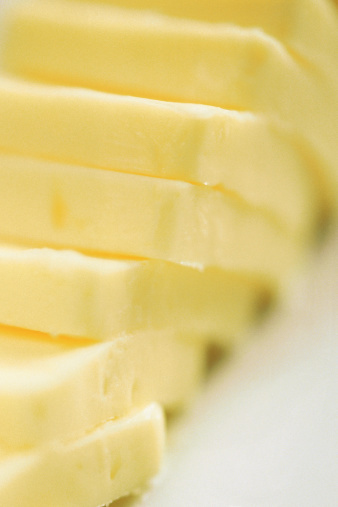 Spilled butter will cook inside a warm oven. Commonly found in glass cleaners, ammonia is a versatile liquid that can clean various household items, including appliances such as ovens and stoves. Pour clear, nonsudsy ammonia into a bowl, set it on a baking sheet and place it inside the dirty oven. Close the door and leave the ammonia sitting in the oven overnight. The fumes naturally produced by the ammonia will loosen the burnt butter — as well as other baked-on grime — from the inside of the oven. Dampen a clean sponge in cool water and wipe the burned butter off the oven walls. Only use this method in an electric oven or a gas oven that has the gas shut off at the main. Baking soda is a common ingredient in various recipes, and it has a naturally abrasive nature that will help scrub the burned butter off the oven while deodorizing any unpleasant cooking odors trapped in the oven. Pour equal parts warm water and baking soda into a plastic container. Mix the soda and water with a spoon for several seconds. Submerge a nylon scrubber in the solution and begin scrubbing the burnt butter off the oven walls. Once you have cleaned the inside of the oven, wipe the surface with damp paper towels to remove the residue. Cutting through tough-to-remove grease and grime, white vinegar will naturally cleanse the inside of your oven without harsh chemicals. Furthermore, vinegar eliminates odors from various surfaces, including those trapped inside an oven. Fill a spray bottle with white vinegar and liberally mist the burned butter. Let the vinegar soak for several minutes while you warm up a clean, damp sponge in the microwave for 20 seconds. Remove the butter, as well as other stuck-on grime, with the heated sponge. Rinse the sponge clean when it becomes soiled, reheat it and continue scrubbing until the oven is clean. Providing a fresh, citrus scent, lemon juice has an acidic nature that will help dissolve caked-on food from stoves and out of ovens. Pour equal parts warm water and lemon juice into a clean spray bottle. You can acquire lemon juice by either squeezing whole lemons or purchasing the juice separately in the produce section of a grocery store. Spray the lemon juice mixture directly on the butter. Leave the juice on the butter for 10 minutes. This will give it enough time to loosen the burnt butter from the surface. Wipe the inside of the oven clean with several paper towels. Repeat the process until you have removed all traces of the butter.